There are so many hot bathroom trends to consider when remodeling, however, having so many options can be a little overwhelming. Not to worry! We have searched high and low to narrow down the daunting list for you. 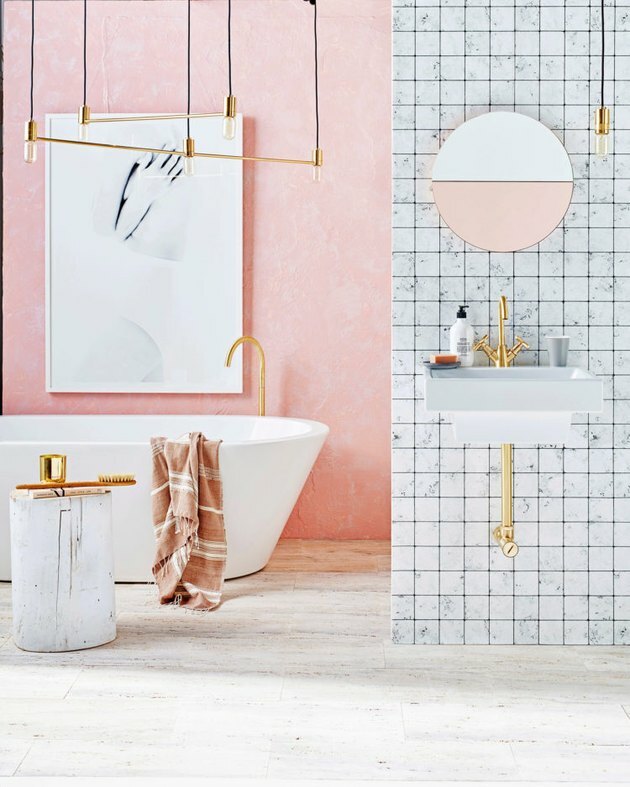 Whether your dream bathroom is rustic, or fun and playful, this list includes an Instagram-worthy bathroom look just for you. Here are 15 inspired bathroom trends to jump-start your bathroom redux. 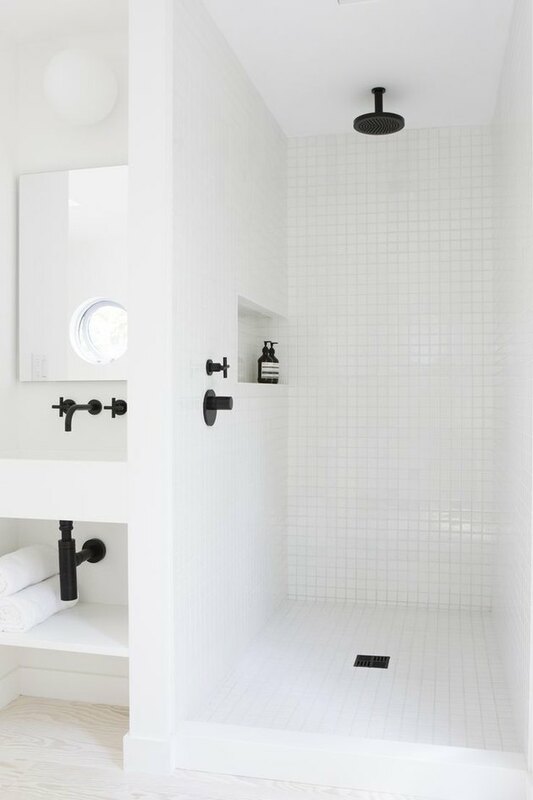 Clean lines, simple materials, and a clutter-free space are the three requirements of a minimal bathroom. 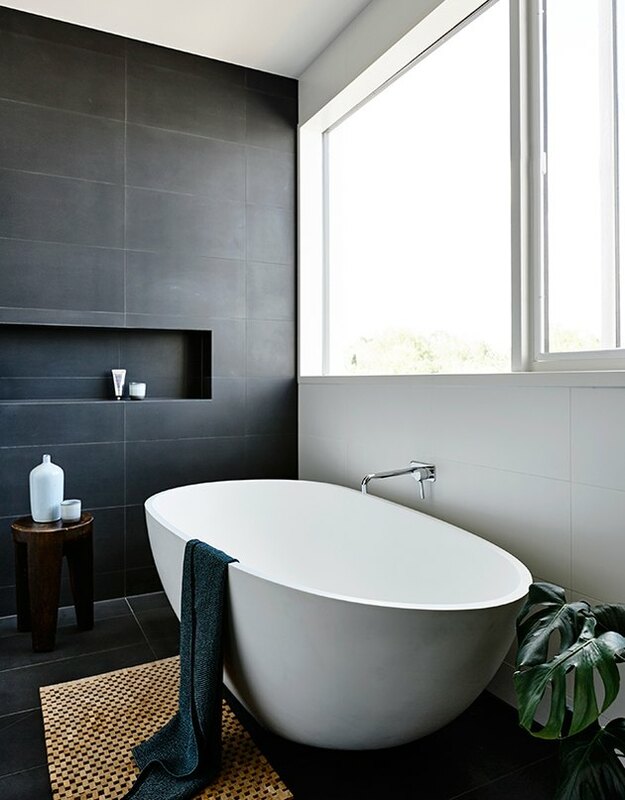 The oversized dark tile used on the wall and floor create a perfect backdrop to relax and unwind without any distractions as you soak in your beautiful tub. Sleek and sophisticated, but not cold, this bathroom proves that modern living is warm and inviting. The rich wood flooring beautifully offsets the cool marble and elegant fixtures perfectly. 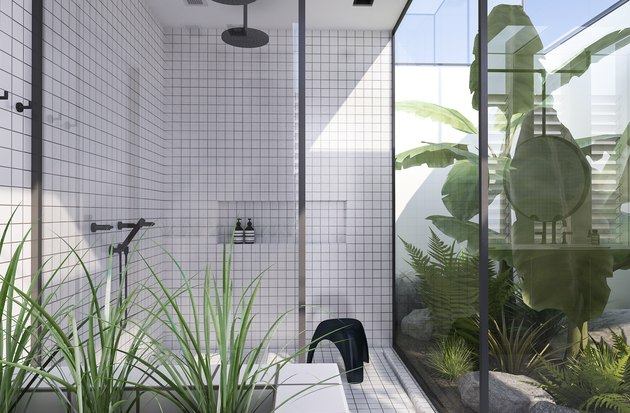 This beautiful contemporary bathroom brings the outside in, with glass walls that look onto a lush green garden. Designed by Eleni Psyllaki, this is the kind of bathroom you build from the ground up with the help of an architect. But for the rest of us, it doesn't hurt to dream of one day showering next to a full height window basking in sunlight. This gorgeous all-white bathroom works because of the confluence of textures created by the different materials used throughout. Competing tile patterns meet up with marble and porcelain to create a monochrome room that is far from flat or boring. 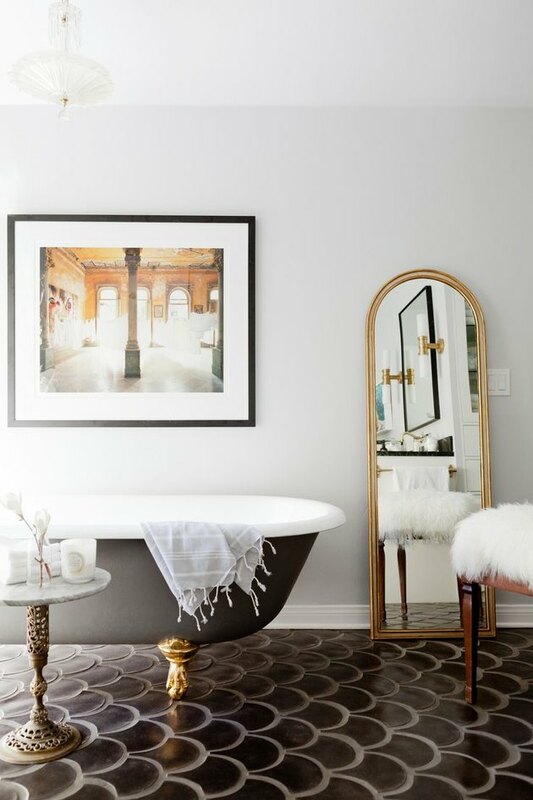 We can't get enough of this romantic bathroom designed by Lisa Mende Design. Inspired by the movie classic, Breakfast At Tiffany's, this whimsical bathroom brings a sense of timeless elegance that never gets old. The free standing bathtub is the star of the show in this scene. Bravo! 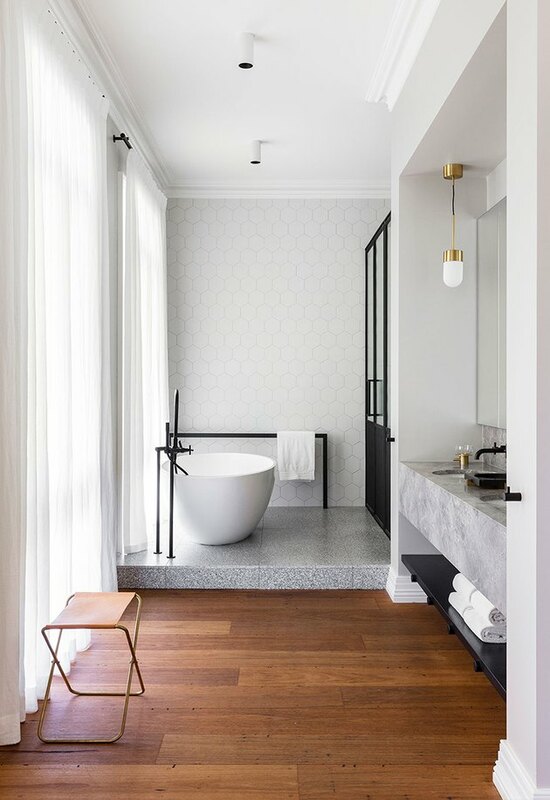 If you love a contemporary space but still have an eye towards the past, this bathroom designed by Rosa Beltran for Homepolish might be the perfect modern take on a vintage aesthetic. The dark fish scale floor tile makes the space feel new, but the romantic free standing clawfoot bathtub give it that vintage aesthetic while never feeling old-fashioned. This beautiful and serene bathroom feels like your own personal spa. 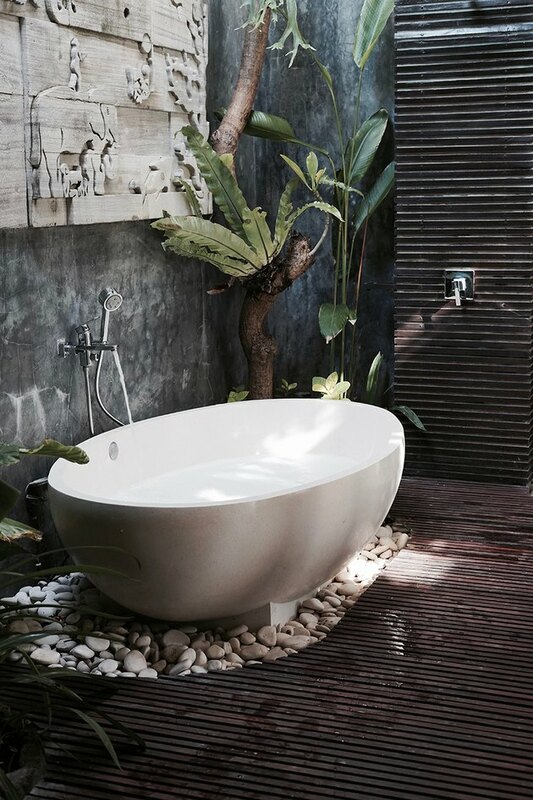 The natural wood, plant life, and river rocks surrounding the bathtub create a uniquely calming space that will make you forget you are bathing at home. Sleek and limited to the essentials: steel, wood, and concrete. 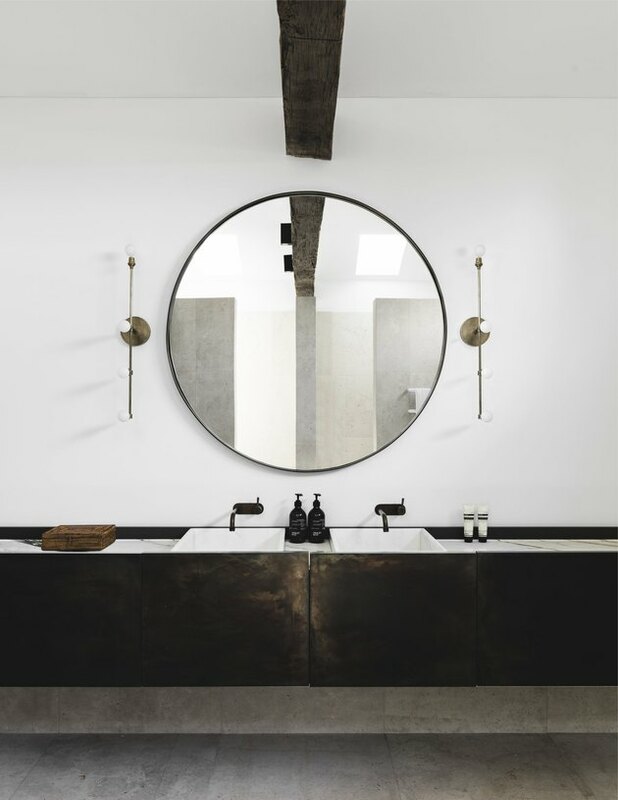 This industrial bathroom's steel vanity, exposed wood beam, and oversized circular mirror create a rugged and masculine aesthetic that we cannot stop drooling over. This dark concrete shower is definitely turning up the heat and the dramatic flair. 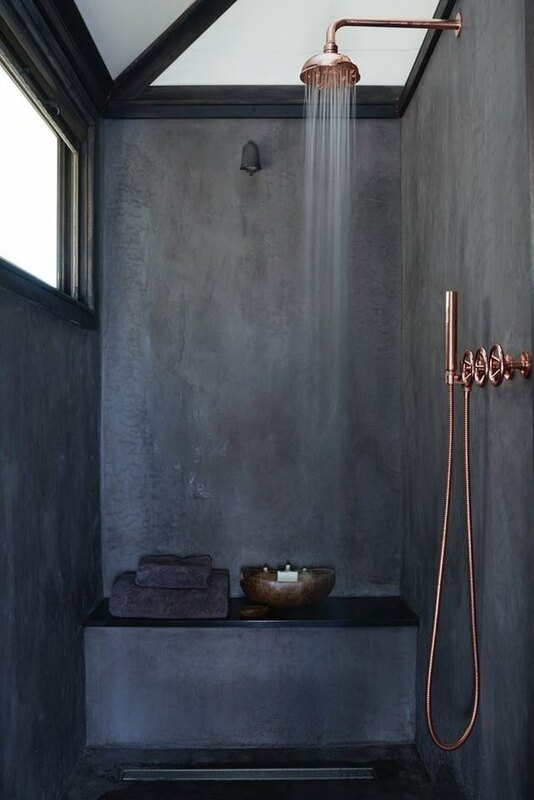 We are swooning over the velvety finish of the concrete walls, which are complemented by gorgeous copper shower fixtures. Hello, Beautiful! This bold vanity cabinet topped with a chunky marble countertop has definitely caught our attention. 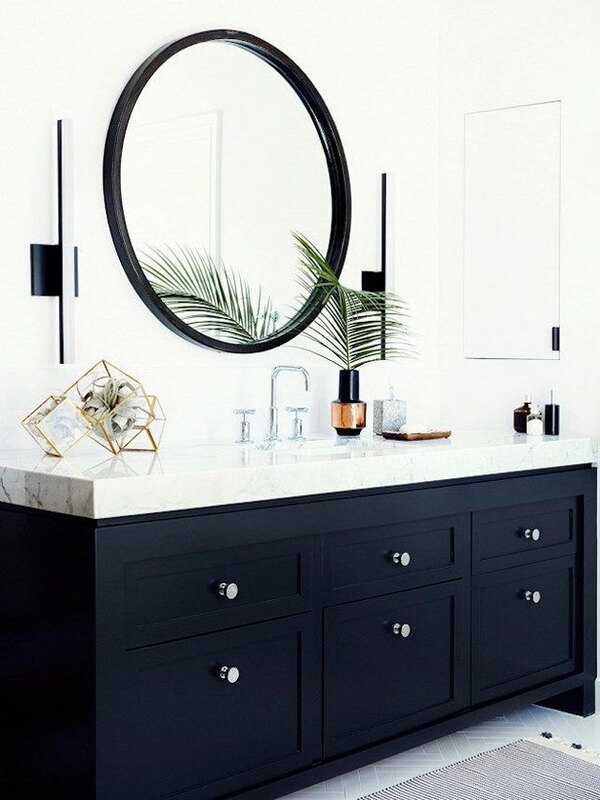 By keeping the rest of the color palette light and bright, the dark color of the vanity works perfectly, and creates a striking statement piece. Now this is our idea of a beach house done right! 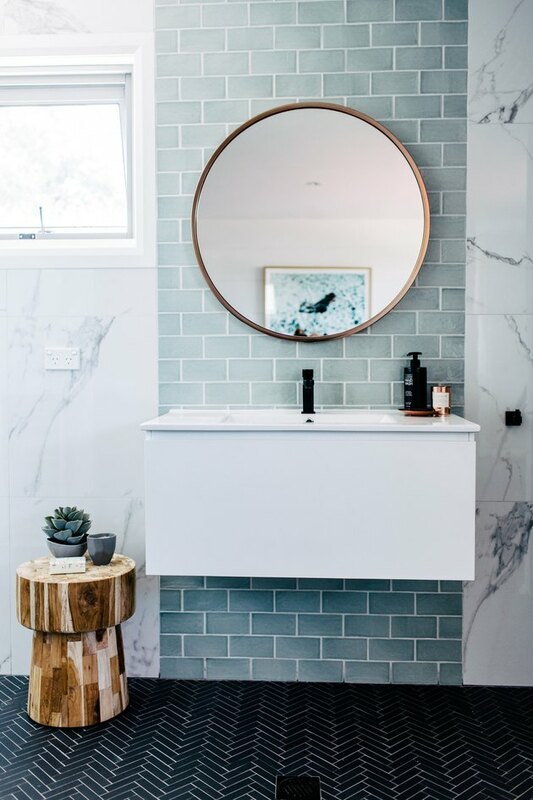 The floating sink and the white marble walls complemented by the sea foam green accent tile create a bright and airy bathroom that puts the chic into beach chic. Why limit your artwork to a frame, when you can use an entire wall? An accent wall is a great way to add character and personality to any bathroom. 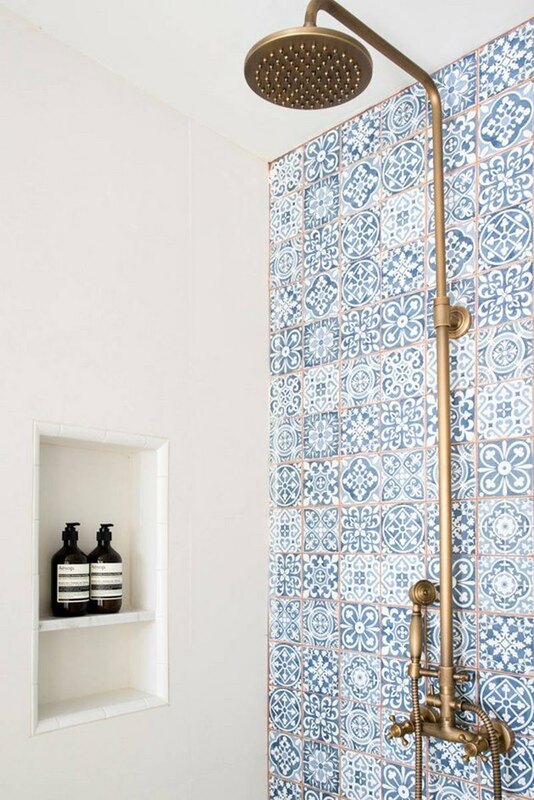 This shower's floor-to-ceiling accent wall covered in beautiful blue and white Spanish tile is a perfect example. If you've been on Instagram lately, you've probably noticed the rose-colored Millennial pink trend that is popular at the moment. This bathroom's soft pastel pink accent wall, paired with white marble wall tile, creates a fun and playful look that will outlast any fad. There is nothing more sumptuous than floor-to-ceiling marble. 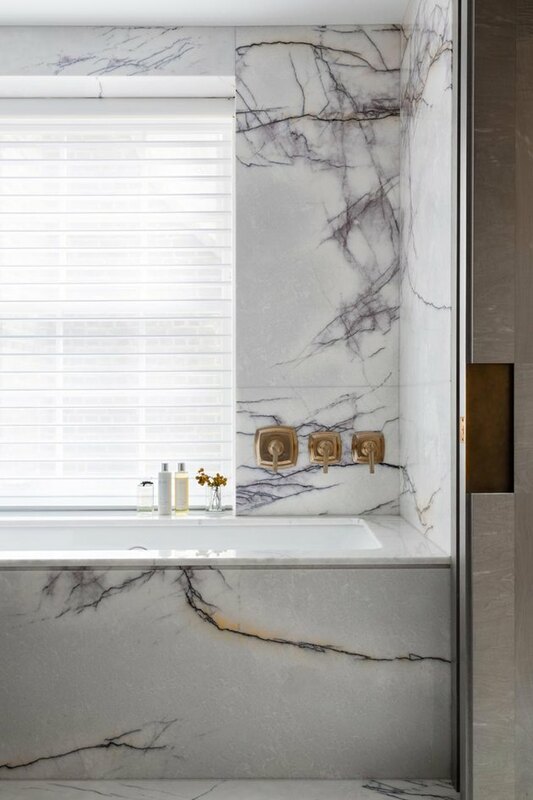 This austere bathroom feels like a hotel spa with its elegant plumbing fixtures that complement the decadent marble veining. Marble is a beautiful but fickle surface in a bathroom, so beware of dying your hair or bathing with anything too acidic or it can stain or destroy the material. This bathroom feels like a refined version of an old-fashioned bathroom. 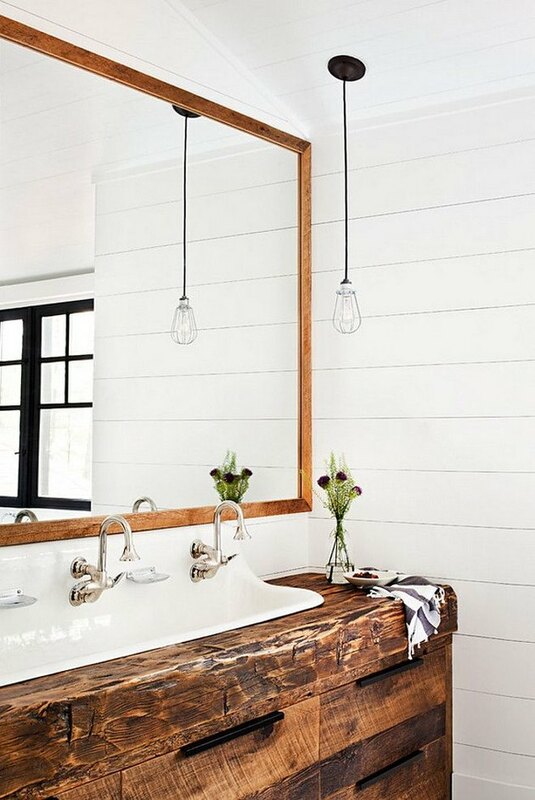 The vanity cabinet (made from reclaimed wood) and the trough style sink with gooseneck faucets create a cool, farmhouse style without actually having to live on a farm.